As summarised on the page about transit through the alimentary canal, partly digested foodstuffs pass from the mouth down the oesophagus (by means of peristaltic action) then enter the stomach via the cardiac sphincter. The stomach is a muscular sac that churns and mixes food. It also absorbs alcohol. Mucus and proteases are present in the stomach. Previous pages described passage of foodstuffs through the alimentary canal as far as the oesophagus, down which each bolus passes by means of peristaltic action (peristalsis). The bolus then passes from the oesophagus into the stomach through the cardiac sphincter. This is the first of a series of pages about the stomach, beginning with a reminder that the stomach lies between the oesophagus and the small intestines. As shown (above right), the stomach is located directly below the diaphragm. The following simple diagram of the main areas of the stomach is described below. (incl. adjoining oesophagus above and duodenum below). The upper (which may also be called the superior) part of the stomach extends, and is connected to, the oesophagus. The lower (which may also be called the inferior) part of the stomach is connected to the duodenum, which is the first part of the small intestines. 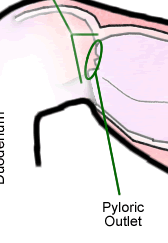 The oesophagus and duodenum are shown labelled above to indicate the position of the stomach within the digestive system. The parts of the stomach labelled above are the cardiac sphincter, the cardia, the fundus, the body of the stomach, the pylorus, and the pyloric sphincter. The cardiac sphincter is the site at which material enters the stomach, a bolus at a time, from the oesophagus. Each bolus passes from the oesophagus into the stomach through the cardiac sphincter. The area of the stomach surrounding the cardiac sphincter is called the cardia and is the first region of the stomach into which material passes (from the oesophagus). The fundus is the area of the stomach located above the cardiac sphincter. The largest area of the stomach is called the body. The lowest and narrowest part of the stomach is called the pylorus. The pylonic sphincter is also called the "pyloric valve" and is the route by which the contents of the stomach is squeezed out of the stomach as chyme, passing into the first part of the small intestine - called the duodenum. The outlet (from the stomach) itself is called the pyloric outlet. A serous membrane forms the outermost layer of stomach. It is composed of simple squamous epithelium and areolar connective tissue. It has a dense network of blood vessels (arteries & veins) that supply the stomach. The serosa is part of the wider visceral peritoneum. Layer of smooth muscle fibres - the longitudinal layer of muscle is continuous with the layer of smooth muscle surrounding the oesophagus. Layer of smooth muscle fibres - the middle layer of muscle is called the circular layer. It wraps around the body of the stomach and extends downwards to form the pyloric sphincter (via which the contents of the stomach exits into the small intestine). Layer of smooth muscle fibres - the innermost layer of muscle surrounds the inner-layers of the stomach and is prominent in the fundus area. The submucosa is a layer of areolar loose connective tissue that contains blood vessels, lymphatic vessels, and nerves). The submucosa connects the muscularis (layer/s of the stomach) to the mucosa (layer/s of the stomach). Band of smooth muscle and elastic fibres. Layer of loose connective tissue that includes blood vessels, smooth muscle fibres, lymphatic tissue and sensory nerve endings. Contains specialised cells that secrete chemicals necessary for digestive processes. These chemicals include gastric juice and the hormone gastrin - and are described on the next page. Above: Diagram of the outer-layers of the stomach, including the serosa and muscularis externa. 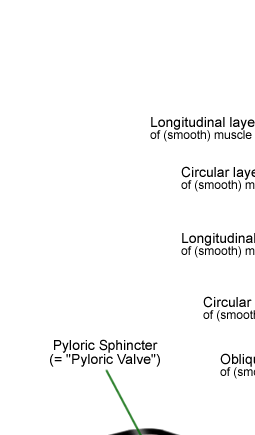 The diagram above is intended to indicate the different orientations of the smooth muscle fibres in the three layers of the muscularis externa. It does not include detail about the inner-layers of the stomach (i.e. the submucosa and mucosa), which are described on the next page. 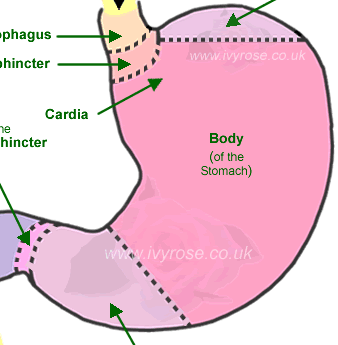 The next page is about the anatomy of the inner-layers of the stomach.